Marbled salamander (Ambystoma opacum); photo by Todd Pierson on Flickr (noncommercial use permitted with attribution / share alike). 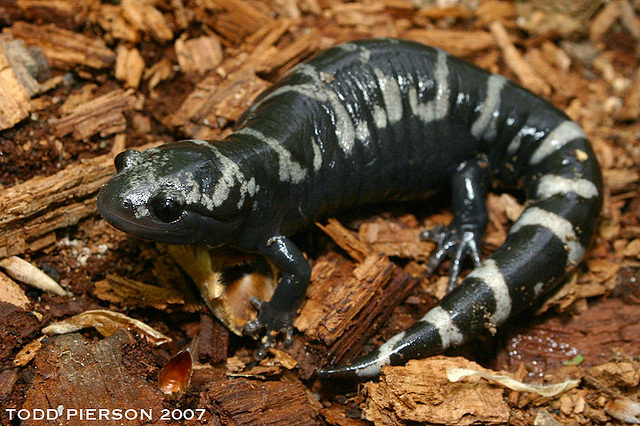 North Carolina designated the marbled salamander (Ambystoma opacum) as the official state salamander in 2013. A striking amphibian with a unique color pattern, the marbled salamander can be found throughout North Carolina. Raleigh teenager Rachel Hopkins led the effort to designate the marbled salamander and the Pine Barrens treefrog as state symbols in order to raise awareness of the importance of amphibian conservation.